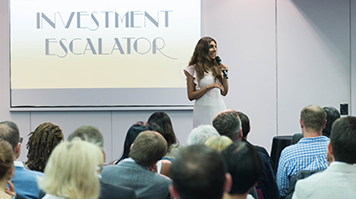 Launched in 2014, London South Bank University’s (LSBU) Investment Escalator provided free business support and training to 594 small and medium enterprises (SMEs) in London who wanted to grow. Delivered by Research, Enterprise and Innovation at LSBU, the programme led to a total of £970,000 in finance raised and 68 jobs being saved. Funded by the European Regional Development Fund (ERDF), the programme helped a range of SMEs from sectors as diverse as IT, health, construction, education, manufacturing and creative media. By combining LSBU’s extensive academic knowledge with the practical experience of industry experts, the programme helped businesses develop through one-to-one coaching, workshops, mentoring, expert consultancy and networking events. The programme delivered over 400 hours of one-to-one consultancy and over 110 workshops in a range of areas, including securing funding, marketing, business planning, businesses effectiveness, e-commerce and basic accounting. SMEs on the programme also benefited from a paid student for 30 hours of academically-supervised consultancy to help complete an acute business-related issue. 12 businesses also received promotional video produced by students to be used on their websites or to pitch to investors. Investment Escalator had a substantially positive effect on the businesses, 25 of which entered new sales markets. As well as raising a total of £970,000 in finance, the programme led to 22 new jobs being created and 68 jobs being saved. "The Investment Escalator helped us gain the skills we needed and find the right people who could help us address some of the areas where we could grow," said Liam Snelling from digital agency Digital Detox, which secured product sales in new markets and created 15 new job roles. The Investment Escalator Programme has been a game changer in my life. The workshops by real life business experts have not only plugged gaps in my business knowledge but also provided me invaluable one-to-one advice, and solutions in areas where I struggled. I recommend this to everyone. Knowledge is powerful. “The range of introductory courses I have attended through the Investment Escalator supported me in gaining a good understanding of the core elements to have in place to run a small business. The more advanced courses, which look at these subjects in more detail, have consistently supported me through my journey of development,” said Katie Bracher, a former sole-trader who has developed into media production company Beitak Productions. In recognition of the programme’s impact, the ERDF extended the programme, which was originally scheduled to conclude in September 2015, to December 2015. Following the success of Investment Escalator, LSBU launched Momentum, an advanced accelerator programme for growing SMEs.